The creation for this room was centered around the customer and the sunken treasures he salvages. The customer and contractor came to James asking if he could create the millwork that would look like the bowels of a boat. James asked for a little time to come up with something and immediately contacted friends in Switzerland. These friends build Ocean going sailboats. Plans were sent to us on how the boats are built. After going over the plans several times, James came up with a couple of designs, types of materials that could be used and discarded ideas along with materials that could not be used. Now was the time to approach the customer with what we could do and the materials we would recommend for the creation. 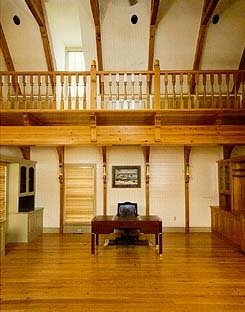 Because the customer wanted this room to be in the proper dimensions, the beams, knees, and balusters had to be thick. The loft area with flooring more than a inch and a half thick needed to be supported. 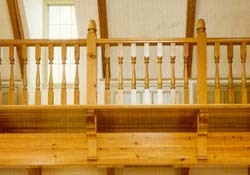 Materials we suggested using were Long Leaf Heart Pine both Reclaimed and New. Reclaimed (true Antique) material was to be utilized for the beams, knees, and balusters because reclaimed material is in beam form and can be milled to the dimensions we would be using. New first growth Long Leaf Heart Pine from Central America would be used for the flooring as well as the loft. This specie of Long Leaf Heart Pine resembles the reclaimed. There would be no stain used on the wood, so a close match was imperative. The loft flooring had to serve a dual purpose. The bottom of the loft was the ceiling in part of the room. We tongue and grooved the 1-1/2" flooring as we usually do but instead of back relieving we put a bevel on the under side of the flooring. With two sided flooring, we had both floor and ceiling covered in this area of the room. As the room came together the feeling of being in the bowls of boat were distinct. With our work completed, we had one request. Are pictures allowed? Most of our customers want their privacy, we respect that. We do not reveal names or locations. Our customers have our word on that. The customer gave us one day to get what we needed.